You want to preserve and increase your property value, so it’s important to make informed decisions regarding your building materials and potential upgrades. Porcelain tiles are attractive, durable and highly versatile. They can be used throughout your home to boost your visual appeal and increase the monetary value of your property. There are countless colors and styles to choose from, and many homeowners are finding that they can handle the installation process on their own. Here are just a few ways that you can use tile around your home to boost the value and make your space more luxurious. Install porcelain tiles on your kitchen backsplash to protect the wall and make it easy to clean. Tile backsplashes are growing in popularity because they can be wiped down easily and add a splash of color and style to the kitchen. As granite moves into more homes, full tile backsplashes are starting to replace the traditional four-inch backsplashes of the last century. Rather than covering the space behind the stove, carry it all the way across the wall to make the kitchen more luxurious and elegant. You can also use the tile above all of your countertops to help tie the area together and create a cohesive look. People love wood floors for their warm look and traditional feel, but they don’t necessarily want to hassle with the ongoing maintenance. Porcelain tiles that look like wood are becoming a mainstream addition to many high-end homes. You can use these tiles to give your kitchen and bathroom a traditional style without worrying about water damage. Install this type of tile in your sunroom or even on your front patio to help improve your outdoor space. Use it in the foyer or right by a patio door so that you won’t have to worry about the sun fading wood or dirty shoes marring it. If you really want to make an impression, then finish off your garage floor with porcelain tiles. It may surprise you to learn that tile can withstand the weight of a car, and it’s a top flooring choice for commercial garages. 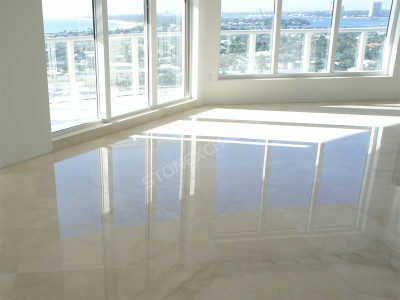 Porcelain tile is very strong, resistant to stains and easy to clean. This makes it a top choice for garages because it’s easy to clean up a small oil spill, and sweeping up after a project will only take a few moments. It’s a very strong and durable material, so you won’t have to worry about painting or sealing the garage floor again for several decades. You know that tile is a great choice for the floors, but you may not have considered how you can create different patterns with the tiles. Rather than setting them in a simple grid pattern, consider turning the tiles to 45-degree angles. When you go with a diamond pattern, you’ll effectively pull the eye down a hallway or across a room. It’s a fun and subtle way to make the space stand out. Medallions are perfect for larger foyers or the center of your kitchen. You can go with rectangular tiles and set them in a herringbone pattern to add visual appeal. Use contrasting colors around the edge to form a border and make the space more impressive. There are countless options to consider, so you can let your creativity flow as you make your home stand out. A great benefit of porcelain tiles is that they’re durable enough to be used in exterior applications. If your front porch is a simple concrete slab, then you can dress it up with some beautiful porcelain tiles. They’re easy to clean and sure to impress. You’ll find that the right color and style will brighten your porch, give it a welcoming finish, and help you make a great first impression. Porcelain tiles can also be used on the patio, around the pool, and even as walkways along the side of your house. The same tiles that can be used in your garage are also perfect for your entryways and outdoor living areas. In the last century, most fireplaces were built and finished with brick. Currently, tile is the preferred finishing material for modern fireplaces. If you have a brick fireplace that feels dated, then have it covered over with porcelain tiles or even natural stones. You’ll update the feel of the entire room and turn your fireplace into a beautiful focal point that you’ll enjoy for years to come. You can change the color and design of the entire fixture by adding attractive tiles. Make it stand out more by finishing off one edge with a lovely border. A finished basement isn’t complete without attractive flooring, and porcelain tiles should be at the top of your list. As long as the basement is dry, you can successfully add tiles to the floors of your basement. They’ll give the room an attractive finished look and make the entire space feel like a more cohesive part of the house. If you’re concerned about the cool temperatures in your basement, then add an underfloor heating system to keep the tiles warm in all types of weather. Homes with upscale building materials hold their value better, and they also fetch higher prices when it’s time to sell. Porcelain tiles are not porous, so they’re resistant to water intrusion and staining. Their durability makes them a great choice for garage and basement floors, and they can also be used in exterior spaces. Use them as your kitchen backsplash and for your fireplace hearth. Your home will be more attractive, and you’re likely to see the property value rise as a result of adding tiles to the home. If you need help deciding which kind of tile to stock your warehouse with, contact Nalboor Tiles and ask us about ordering a free sample, or place your order with us online today. Dark Gray with black speckles Matte Porcelain Tile.